If you haven’t had the pleasure of tasting Portuguese wines yet, you’re in for a treat and some surprises. Wine tasting in Lisbon is a very popular pastime and there are several wineries near Lisbon so you don’t have to travel far to do a wine tour and tasting session in a special setting. Showing true dedication to you, dear reader, I’ve been gradually working my way around wineries in the various wine regions around Lisbon. They range from ultra-modern to traditional, family-run and historical wine estates, some of which produce unique wines. Let’s start with one of the more extraordinary Portuguese wines. Colares wine is unusual in that the grape vines grow in sandy soil on the coast near Sintra. The ungrafted Ramisco grape rootstock is planted in the ground and the resulting vines tended for their first two years then covered with about 2 metres of sand to continue their development. These unique growing conditions helped protect the vines from the phylloxera bug that wiped out much of Europe’s grapevines in the late 19th century, making these some of the oldest rootstock in Portugal. There are two main visitable wineries in Colares and most Sintra tours that include winery visits take you to Adega Regional de Colares. 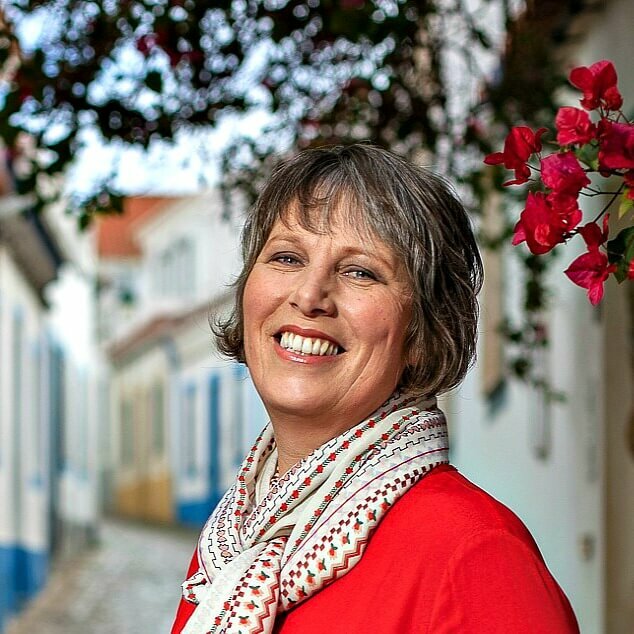 This full day foodie tour of Sintra and its surrounding villages includes a tasting of Colares wines. I chose to visit Adega Viúva Gomes, partly because the building is covered in azulejos and partly because it seemed smaller, with more character. To help us appreciate quite how extraordinary the wine from sandy soils tastes, the Adega’s current owner, José Baeta, first gave us a ‘normal’ table wine from a local hard soil vineyard. The white Colares wine from sandy soil was much darker in colour with a distinctive mineral flavour. When comparing the reds, the Colares was more tawny in colour with lots of tannins, partly because part of the grape stem is left in during fermentation. While the information about the wine-making process and the history of Colares wines was interesting, I was mildly disappointed that we didn’t get to visit the sandy vineyards in person and instead had to rely on photographs. The Adega Mãe winery offers a complete contrast to the ancient wines and establishment in Sintra. It’s housed in a beautifully designed modern building amid Lisbon’s vegetable garden, i.e. the green agricultural lands just south of Torres Vedras. 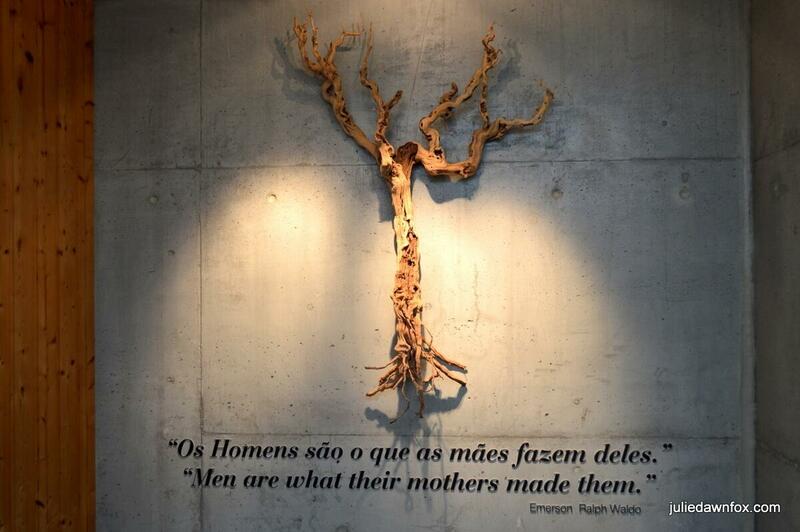 Mãe means ‘mother’ in Portuguese and when Ricardo and Bernardo Alves established the most recent winery in Portugal as an extension of the family’s other food-related businesses (cod and coffee), they named it in honour of their mother. I had unwittingly tasted their flagship wine, called Dory, before my visit. Although the name refers to a traditional wooden fishing boat, it is remarkably close to my friend’s name, Dori (yes, the one who walked the Way of St. James with me), and either she or one of her other friends had bought a bottle for fun. The fishing boat symbolises the mineral notes that are evident in the wine, especially the white. As the manager Diogo Lourenço explained, it also represents the concepts of challenge, impact, freshness and vivacity and the proximity to the ocean, which contributes to the local microclimate. Dory wine itself (white 2014) is a blend of three Portuguese grapes, two of them local varieties (Arinto and Fernão Pires) and the French Viognier to balance the flavours. Adega Mãe is open daily from 9:30 to 6:30 (Sundays 11 to 6). Closed for lunch between 1 and 2. See the website for details of wine tasting options. There are several wineries around Palmela but having taken the bus south from Lisbon, I wanted to visit one within walking distance of the town. Quinta do Piloto turned out to be an excellent choice. 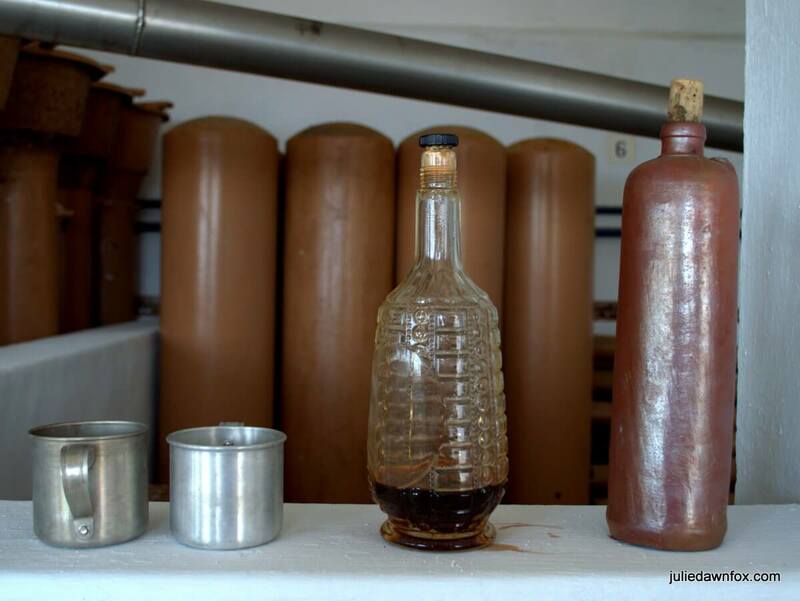 The winery tour began in the crushing room with a warming shot of aguardente (brandy) mixed with moscatel wine, served in a tin mug. Ana then led us through the vineyards and recounted the history of the family-run quinta before taking us back inside to see where the magic happens. 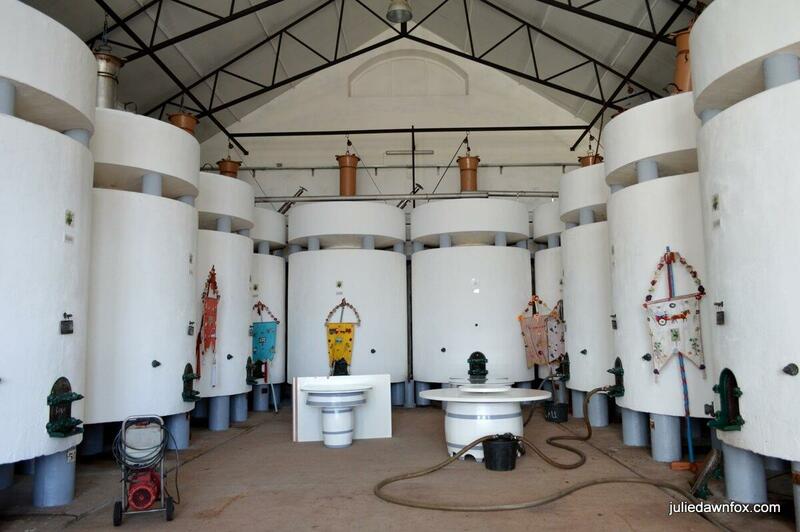 While some of the machinery is modern, the 25,500-litre concrete tanks have been in use since they were installed in the 1940s. Seeing them from above via the upper platform enabled Ana to explain the system they use for natural fermentation. Back on the ground floor, I was curious about the colourful embroidered standards that were leaning against some of the tanks. They’re called Adaifa flags and traditionally, the workers wives embroider new ones each year to accompany the last grape truck of the year. Another local custom dictates that each harvest, all of Palmela’s wine producers donate their first batch of grapes to the church. The grapes are then trodden in front of the church and the resulting must, known as the 1st Must, is kept in a barrel in Quinta do Piloto, which acts as guardian. After a year, the 1st Must is given to local churches to be used in communion. Quinta do Piloto produces both moscatel and table wines, some using the Roxo moscatel grapes. Since the bottle I bought after the tasting soon got polished off, I was very happy to find it in a supermarket near me. 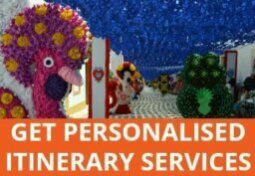 Find out more about visiting and shop opening hours on Quinta do Piloto’s website. If you’re looking for a small group tour of Setubal wineries, including Quinta do Piloto, check this one out. The village of Azeitão is also within the moscatel wine region near Setúbal and is home to two major players in the wine industry. Many tours of this area and the neighbouring Arrábida Natural Park include a visit to the centuries-old José Maria da Fonseca winery in the centre of the village. I opted to combine my wine tasting session with a dose of art and the 15th century palace of Quinta da Bacalhôa. The tour begins with a journey through an astounding collection of contemporary sculptures and African art before the heady scent of maturing moscatel wine hits you from the stacks of oak barrels. The table wine barrels are surrounded by panels of antique and modern azulejos so you’ll need to choose whether to pay more attention to the guide or the ceramics at this point. I chose the tiles, although I needn’t have worried – there were plenty more azulejos at the palace, as well as views of the vineyards. You don’t get to see the wine-making facilities on this tour but the standard wine tasting session at Quinta da Bacalhôa includes their moscatel. Read more about the experience in this post: Art, Azulejos, Cake and Wine in Azeitão. The cement tanks at Quinta do Gradil were installed by the Marquês do Pombal, the man responsible for rebuilding Lisbon in the 18th century. What makes this place special, aside from the history, is the onsite restaurant and the innovative wine-related activities. During my visit, we followed the tour of the winery with a short drive to a windmill in the Montejunto mountains to do the wine tasting. My favourite wine, and one I was thrilled to find in a supermarket in Coimbra, was the 2014 white Sauvignon Blanc and Arinto blend. In another happy coincidence, I realised that the Mulha Velha (Old Donkey) red wine I’ve drunk on more than one occasion is also from Quinta do Gradil. Don’t let the masculine-sounding name put you off! The Manz family are relative newcomers to the Lisbon wine scene, having moved to the village of Cheleiros near Mafra in 2005 and produced their first wine in 2008. Manzwine is all about quality over quantity, which is apparent from the size of their wine-making facilities, housed inside what used to be the village primary school. They currently produce 150,000 bottles a year and supply Michelin-starred restaurants and duty free stores. In establishing their small winery, the family have been careful to preserve the village history and artifacts, incorporating the Roman bridge into their logo and using the traditional wine-making machinery and utensils they found to create a tiny wine museum above their shop. One of the few wines produced at Manzwine is the unique Dona Fátima, made from Jampal grapes which are only grown in Cheleiros. Check opening hours on the Manzwine website. 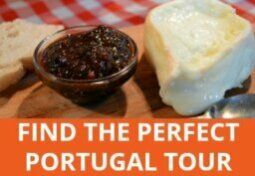 Or take this tour, which also visits Quinta da Murca in Bucelas. Although you can reach some of these places, such as Colares, Palmela and Azeitão, by public transport, for the most part, you’ll need a car (see tips for renting a car in Portugal). If you’d rather leave the driving to someone else so you can fully appreciate the wines, you’d be better off visiting the Lisbon wineries on a guided tour. You’ll learn more about the surrounding area that way, too. If you would like a little extra information about Portuguese wines, check out these books. 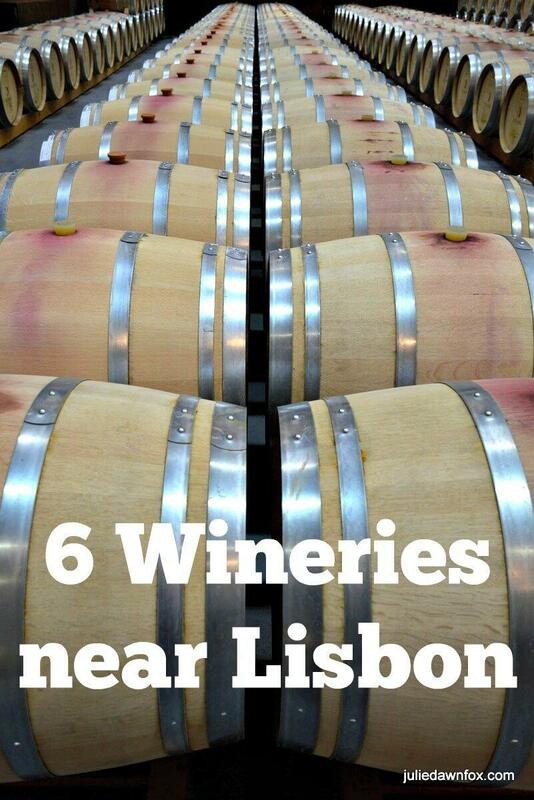 6 Great wineries near Lisbon to visit for tours and tastings. Disclosure: I visited some of these wineries near Lisbon, namely Adega Mãe, Manzwine and Quinta do Gradil, as a guest of Singulartrips and the respective wineries. Thank you for your detailed post. I’m from Lisbon and I didn’t visit any of the wineries you mentioned, shame on me. But I want to ask you and all the Portuguese wineries lovers: what is the wine you love the most? And why? (Could be Portuguese or a different country) What do you think that we portugueses have different from others? What is that distinguishes us? Thank you! Thank you for giving us such a wonderful article! Can you please tell us which wineries are the most visited/ which one is one of your favorite? I don’t know which are the most visited but of these, I’d say my favourite was Quinta do Piloto. Enjoyed all three of the wineries we visited with Singular Trips…and now we have three more Lisbon-region vintners to visit! Great round-up, Julie! Thanks, Anita. I’d definitely make a point of heading to Quinta do Piloto. What a wonderful overview! Is it possible to visit any of the wineries you’ve highlighted by bus/train/taxi from Lisbon? 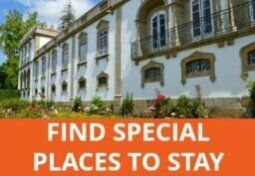 You can definitely get to the ones in Palmela, Sintra and Azeitão by public transport. Not sure about the others.